The presented room availability, rates and discounts are actual and final for all our 252 hotels in Hua Hin. By far, the most important places of rest are beautiful sandy beaches, which are represented in abundance both in the city and in the surrounding area. The main beach of the resort originates near the Sofitel Hotel; it is ideally equipped and has well-developed infrastructure. 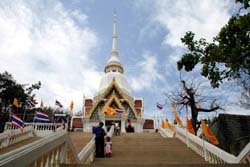 Khao Tao, Khao Takieb and Suan Son beaches are also of great demand. There are attractive restaurants, sports facilities and special play areas for children. Those who are accustomed to rest in a more relaxed atmosphere would enjoy the Khao Kalok beach. Surrounded by high cliffs, it is an ideal destination for fans of a relaxing pastime. Tourists that want to have a rest with health benefits are sure to visit local spas and massage parlors. Look for them in the vicinity of lively beaches; some larger hotels also have spas. Choice of sports and entertainment options is huge. There is a great go-karting center close to the airport. Here you can have a great time as a family; the professional track and complete sets of required equipment is available to customers. The central beach of Hua Hin is an ideal place for water sports. Surfing and kite boarding, canoeing and kayaking, playgrounds for football and volleyball - that's just a small part of the entertainment options available to tourists.